This blog was written by Joshua Ogboenyiya, SKW summer intern. I confess – I’ve been a speeder. I would often catch myself driving 7-10 miles over the posted limit. It was a dangerous habit that I and many others need to break, considering that over 35,000 people died in motor vehicle accidents in 2015, speeding being a top cause. Speeding is especially dangerous for children in school zones. Every day, a child is at risk from speeders. Speed above 20mph puts children at a greater risk of injury. We know from an AAA Foundation study that, when a car is going 35mph and hits a pedestrian, the risk of death and significant injury are 30 and 64 percent. The dangers increase for younger children because they have more difficulty judging how fast a car is approaching when crossing the street. This year, 10-year-old Delilgha Rosa-Clark, a student at Hellen Caro Elementary School in Pensacola, Florida. was struck by a car while riding her bike to school. The driver did not yield the right of way. Delilgha was flown to Sacred Heart Hospital, where she later died. The posted speed limit was 25mph. If the speed limit was reduced, Delilgha would have had a higher chance of surviving this accident, or it may have been avoided altogether. Stories like this happen every day, and they shouldn’t. As a community, we can join together to make changes that can save lives, and some can come at a modest expense to the city. 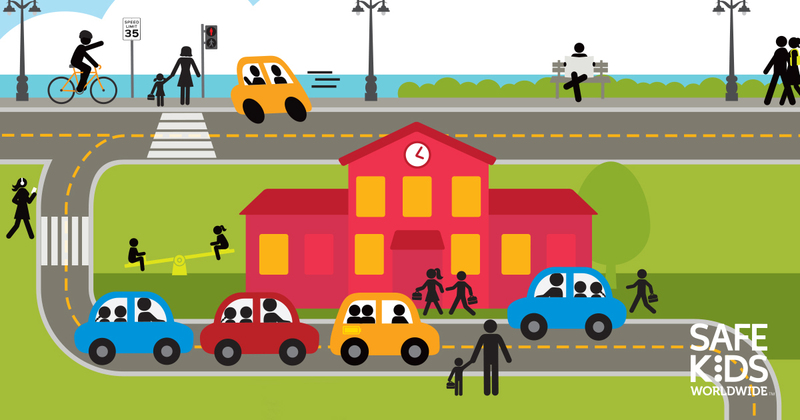 Here at Safe Kids, improved safety in and around school zones is a major priority. Now, you can take part in the action, by lobbying for safety change in your community. Safe Kids created a Take Action Toolkit: How to Fix an Unsafe School Zone to help make smart public policy and save lives in school zones. It starts with a virtual map of a school zone with six danger areas, such as a street where drivers habitually speed or a dysfunctional drop-off/pickup area. You can click on the school zone risk area that you think changes in policy or infrastructure could make safer. That will open a very detailed but easy-to-follow action plan to make changes. The action plans have model letters, sample social media posts, relevant facts and much more. You can go to the Sensible Speed Limits Action Plan and get to work. Trying to fix an issue that is often overlooked may seem hard, but with the guidance of the action plan and the support of your community, speeding can be reduced and kids can be safer on foot and on their bikes. This and other action plans have been created to help parents and communities improve safety standards. We plan to update these regularly and urge everyone to take advantage of these resources. If you have any questions, please reach out to the public policy team at agreen@safekids.org and areich@safekids.org. The Take Action Toolkit: How to Fix an Unsafe School Zone was proudly sponsored by FedEx.